Tri-City Hospital Foundation has launched its groundbreaking SonoCiné, an ultrasound breast cancer screening tool designed to save women’s lives by identifying cancer early that can be missed by mammograms, and is now accepting appointments for patients to be screened by the technology. Tri-City Medical Center is the only hospital in San Diego and Orange County with SonoCiné available. For women with dense breasts and implants, who are 4-5 times more likely to get breast cancer than women with low breast density, it’s difficult to spot small cancer tumors using traditional imaging. SonoCiné can detect cancers as small as 5 mm (or the size of a lentil) in these women, which can directly impact treatment and even save a patient’s life. At least 40 percent of all women have dense breasts. Breast density describes the proportion of diﬀerent tissues that make up a woman’s breasts and is revealed through a mammogram. Having dense breasts increases the chance that breast cancer may go undetected by a mammogram, since dense breast tissue can mask a potential cancer. 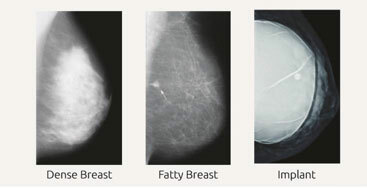 Cancers on a mammogram of a fatty breast appear white on dark tissue, making the cancer harder to spot in dense breast tissue or hidden behind implants because dense tissue and implants also appear white. SonoCiné takes ultrasound to the next level by picking up every single inch of a woman’s breast tissue— vastly increasing the odds of survival by detecting cancers when they are small and easier to treat. At the Grand Opening event on Friday June 22, Dr. Jennifer Mayberry, a radiologist with Tri-City Medical Center, demonstrated how the technology works. Tri-City Medical Center now accepts appointments for SonoCiné. To schedule an appointment, call 760-940-5017 or email feltja@tcmc.com. Tri-City Hospital Foundation is celebrating more than 50 years as a link between the community and the hospital. Since its inception, donors have provided millions of dollars in grants to Tri-City Medical Center. Many of the hospital’s most mission-critical facilities have been supported in whole or part by Tri-City Hospital Foundation’s initiatives and community donors. Recently, Tri-City Hospital Foundation helped fund a renovation of the Labor & Delivery Department. For more information and to learn how you can make a difference, visit www.tricityhospitalfoundation.org.